Synopsis: Three girls with three deadly secrets. Only one can wear the crown. 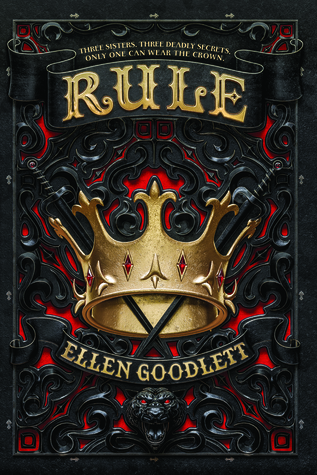 Review: Rule is an awesome new YA fantasy story pitched as Three Dark Crowns meets Pretty Little Liars with a smidge of King Lear. And if you know me AT ALL you know this is right up my alley. Three Dark Crowns is one of my favorite new YA series. I watched and loved Pretty Little Liars (up until the last few seasons, sorry). And just earlier this year I read a retelling of King Lear, The Queens of Innis Lear, and it was amazing! So, anyhow, I really enjoyed Rule. Our main characters are three girls who find out that not only are they sisters, but their familial link is their father, the king, who is dying and needs an heir to the throne. The girls couldn’t be more different, but I just love each of them so much. I was actually expecting to have a favorite like I did with Three Dark Crowns, but I can’t choose. (I’m fully #teamarsinoe btw.) Each of the sisters have their own struggles and strengths and I loved seeing how they worked to figure out who is sending them messages. Because, oh yeah. This YA fantasy does something that I don’t really see in fantasy much: mystery, suspense! The entire story has you, along with the main characters, trying to figure out who knows their deepest, darkest secrets and is trying to get rid of them. I thought I knew. I was sure I had it figured out and then, TWIST. So, so good! I just really adored this book and I’m dying for book 2! Thank you so much to TheNovl for sending me a review copy!